The Ultimate Surface for your Farm Races. 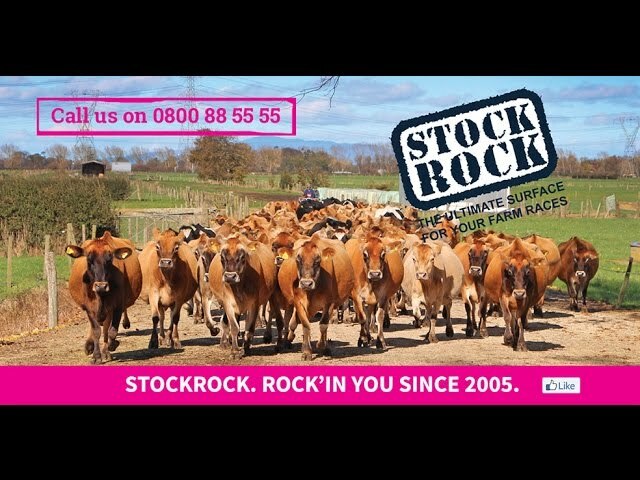 StockRock is a well-proven, hard wearing, chalk-like, farm race surface which cements well and is easy on the cows' hooves. StockRock provides an even, smooth, durable farm race surface. When applied to farm races in accordance with the StockRock Installation Guide, cow flow to and from the shed is dramatically improved, and herd lameness is reduced. Farmers find that sharp stones no longer appear in the yards. No sharp stones means reduced risk of stone bruises and hoof infections. Ask any farmer who uses StockRock and they will tell you this is the best product they have ever seen or used on their farm races. Most farmers like Shane to call out to their farm to visit the area requiring StockRock. A site visit is a free, no obligation part of the quotation process. Shane can discuss the options for purchase-only of StockRock right through to supply, delivery and installation of StockRock.